Yet another Powermatic review, close up. As I stated in another review, I spent well over a month going back and forth between the Powermatic PWBS-14CS, with riser, and the Grizzly G0513X2. The Grizz is a 2HP, 2 speed model, the Powermatic is a one speed, 1.5HP model. 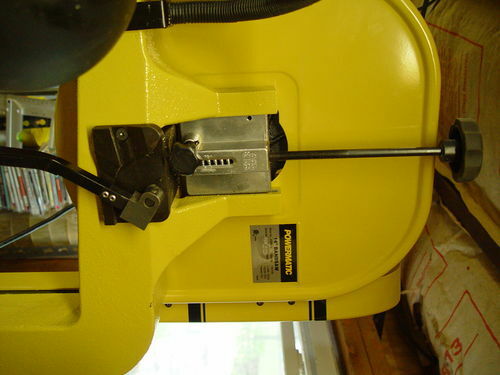 The Powermatic comes in around 225 lbs. The Grizzly comes in at about 390 lbs. But the Powermatic has the Carter quick release system, which is totally visible with the big red ball right in front of your face. The Grizz has a black lever that is hidden on the backside, and more than once I’ve turned on my Grizz with the blade untensioned. The Powermatic comes with a light. The Grizz does not. The Grizz takes up more floor space with the motor sticking out the back, and is just bigger overall. Also taller. The Grizz has no defined tension scale, (1-9 with no reference), the Powermatic at least has numerical guidelines. The Powermatic has the blow line on top, the Grizz does not. Surprisingly, the Powermatic will resaw a bit larger than the Grizz, about 1/4”, but I have no illusions that the Grizz would drive through that height of resaw whereas the Powermatic I would not even try it. For me, this choice came down to a few items. One, after standing in front of the floor model Powermatic a few times, pretending to saw, I felt that for smaller work, which is why I bought this, this was just more able to make me feel like I was cutting tight corners on a saw meant to do that. When I cut tight corners on my Grizz G0513X2BF, the feeling is kind of like cutting doll house parts out on a tablesaw. The second item was floor space. I have very, very little, my shop being only about 260 sq. ft. total. And I own WAY too many tools, so I constantly fight floor space. Finally, it came down to availability. I finally decided that I didn’t want to do the delivery dance again, and decided to buy the Powermatic from my local Woodcraft, and eat the tax. They responded in kind by giving me two options: Take a new one in a box in two days at the store, or come and take the floor model, (assembled but never cut wood), and get 10% off. No-brainer, $119.99 discount, and I got it right away, no worries about tracking, will the truck come in the rain, sitting around the house a whole day waiting for the truck, will anything be broken by the carrier, etc. And I got to take it apart the way I wanted to, to get it in my SUV. This gave me some valuable insight on how this is built that you may not see when you get a fully assembled top in a box. So those items are what I will concentrate on. Let me premise this by saying that I absolutely love the saw. Cuts straight, clean, passes the nickel test, love the light, love the tension release. It is all that I wanted, but remember, I also own a big Grizzly G0513X2BF that I do all my resawing on, so this is a much more intimate machine for me. There are three pictures above, and I will insert a couple more here to highlight issues on this saw, and positive items. When I took it apart to take it home, I wanted to get the tension mechanism off, at least the tall screw rod, and the light. This caused me to take off the top wheel and upper guard complete so I could get at the light cord which is tagged inside the casting and be able to lift off the upper wheel axle unit with spring. I have to say, when I pulled off the upper wheel, I was taken aback at the light weight of the cast wheel. It is balanced, as witnessed by many drill marks on the backside, but the wheel is just light weight. Still, it is a cast wheel and has a quality bearing and turns very smoothly. The second item was the upper axle pivot assembly. I was dissapointed again with the light weight, and the fact that “Taiwan” was clearly stamped on the front next to the hardened axle. But I don’t think it is a zinc casting, or if it is, it is high quality. It looks more like aircraft aluminum. Still, the same old style of pivot as on millions of other 14” saws made in the last decades. The Carter quick release I love, but durability is interesting. I felt that probably dozens, if not hundreds of guys had tightened this and released this on the showroom floor before I bought the saw, so if it was going to break, some guy would have beat me to it. That being said, it seems to be built to be JUST strong enough to do what it has to do. It works well, I will say that, but I did grease the rack and pinion just to add a little ease to it. I LOVE the concept, and if it holds over time, I am in love with this kind of tensioning/untensioning. Another thing I have a problem about is the reversed blade guard on the left side as you change the blade. I’ve had this style once before, hated it, and my last three saws have all had the channel or bent frame style, that you do not have to remove. This unit, the guard is mounted and must be removed for a blade change. Not THAT big a problem, save that the thing is held on by two wood screws which are screwed into what seems like poly centers on hex posts that also hold the upper and lower blade shrouds. (See the picture) PITA, to be honest, to not only take off the two screws and the funny shaped flat washers, but I think for sure the poly will wear out in a few years. I might look into machine thread thumb screws, and re-tap the poly. The final thing that is a bother is the lower thumbwheel adjustment on the lower thrust bearing. (Again, see picture) Just cannot get two fingers into that small space. Nice item, poorly placed. I love the dust collection, and the blow pipe on top. Clear, clean cuts, the thing seems to stay clean inside, and so far, no real collection of wood particles on the lower wheel. Well done. The two-piece table is interesting. I had no problems leveling it, and I can see where tilting with some room still over in the arm area will be helpful. I actually like the way it tilts over my Grizz, which is a lot harder to lift due to the size. There is a Powermatic label on the motor, not some strange Chinese company or no company like on my Grizzly. The light, some have complained about the flex arm getting in the way of the tension release. Not so, if you put in a 65 watt flood light that lights up the entire table. You can then bend it back and out of the way, allowing the tension release to clear the flex arm every time. Obviously my riser was installed at the store, so I don’t know if they had any problems. 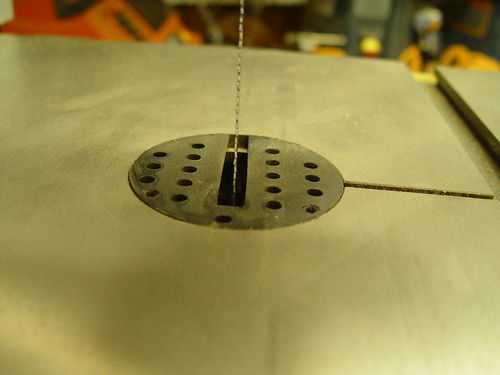 I do know it is installed properly, and the saw needed almost no alignment to get the blade to track perfectly, 90’ to the table, blade gullets at the top of the tires. No drift, and a small resaw test showed I do not need the half-round resaw adder they gave me with the fence. And that was with the cheapo blade they give you, which was one of only two cuts I made with it before trashing it for a Timberwolf. Oh, one last thing. The insert was a bit thick for the table. Not mis-adjusted screws, but just too much plastic. Had to shave it a bit to get it level, but no big deal. I think this saw will give me years of service, if used for what it is intended for. I don’t see this as a resaw unit, having to take on 6”, 8”, 10” resaw chores over and over. This is more of an intimate saw for doing slightly smaller work, and I love the table height over my Grizz a bit better, the lighting, the tensioning device, all make this a perfect saw for my second use. Very detailed! Good luck on your choice. thanks for the review ,lot of good details. That is a thoughtful review. Thanks. Paul I too bought a 14” Powermatic within the last month I gave a very quick review as I was unpacking and assembling it. now that I have used it for almost a month I have learned a few things? but today I took the base off and no broken welds. I can fix it I will add couple weld on threaded tabs and thread a couple 1/2 ” cap screws down to the floor to be tightened with a 3/4 socket. And to be honest, I don’t move my bandsaws around hardly at all. I did, however, put my saw on a piece of 3/4” plywood. My shop has an asphalt floor, (Old converted garage), and the plywood gives it a solid base that also absorbs vibration just a hint. I keep other large tools on steel diamond plate. You work with what you got! So far, putting a couple large, (5” thick) bandsaw boxes through it using a 3/16” blade to cut drawers and body, it has performed flawlessly. The bandsaw box is a full lotus box, about 13” tall, so it will have a lot of curved cuts when done. Keeps right up, and the extra 3/4 pony (1.5HP total) over my old 3/4 horse Porter Cable is quite noticeable. I am still on the fence on the Carter de-tensioning system, it still looks a bit lightweight to me. But so far, every time I shut it off I de-tension, and so far, it has lived up to the hype. I doubt I will ever have anything bigger than a 3/8” blade on this saw, so maybe good to go. I do think that over time, the 65 watt flood lamp I put into the lamp will die early, since I see just a bit of vibration in the light, but that only occurs when cutting. I hate fluorescents that screw in, so I probably will look for a LED flood of some sort that fits that lamp hood. Paul I finally got my saw sitting on the rolling base and it is pretty darn stable , so I am a happy camper. now I am going to show my ignorance my rear guard is open at the front so it is just a channel now do I have mine on backwards or do you? The book shows a picture on page 7 and looks to me like the channel is open, so you would not need to remove it to change blades? If you look at the very first picture at the top of my review, it shows the guard in place, with the flange tabs where the screws go mounted on the rods that come off the main wheel covers. It covers the blade and has to be removed to change a blade when put on like this. But I just ran down to my shop, took a good look, also looked at the exploded parts page in the book, and it does show it open channel, just as you say. Looks like when the boys at Woodcraft put in the riser, they forgot to put the blade guard back on, got a blade on it, and were too lazy to take the blade back off to get the guard right. They put it on backwards! I came along some time later and assumed that was the way it goes, since it turns out you can flip it and it will go either way. Thanks! I’ll be taking off the blade and putting the guard on correctly later today. Sheesh! I’m moving closer and closer to the ten year mark with mine. Early on, my Carter Quick Release broke and I had to put out a few bucks for a new part. When I got it, it was evident there had been a design change to address and engineering blunder. Now, innumerable uses later, it’s still working fine. I liked having a light, but the neck was too short and would not position where I needed it. As I note in my review, I mounted it on the guide bar housing and it works great, without interfering with opening the door or using the tension release. I’ve done some twelve inch walnut using Olsen and Timberwolf 3 TPI blades. It wasn’t a five second job, but I’ll be doing it again and again. The manual tension knob was never my favorite. Add to that, the threads stripped about six years down the road. I bought the aftermarket hand crank and regret not having done it at the get go. As to the mobile base, maybe they’ve changed, but I wouldn’t be without it. In fact, it inspired me to make nearly everything in my shop more mobile.